With summer in full swing, everyone in your neighborhood is out grilling up their steaks, chicken, and burgers. Amazing side dishes are flying off grills everywhere, like corn on the cob, sliced zucchinis, and baked potatoes. But the grill isn’t just for your main course and sides anymore. Keep the coals rolling for some delicious grilled fruit for dessert! I’ve always had a healthy(?) obsession appreciation for peaches, whether I’m eating them fresh, baking them into a sweet galette, or letting them soak in spiced rum and sugar for a few months to savor in the winter (hello peach rumtopf!). 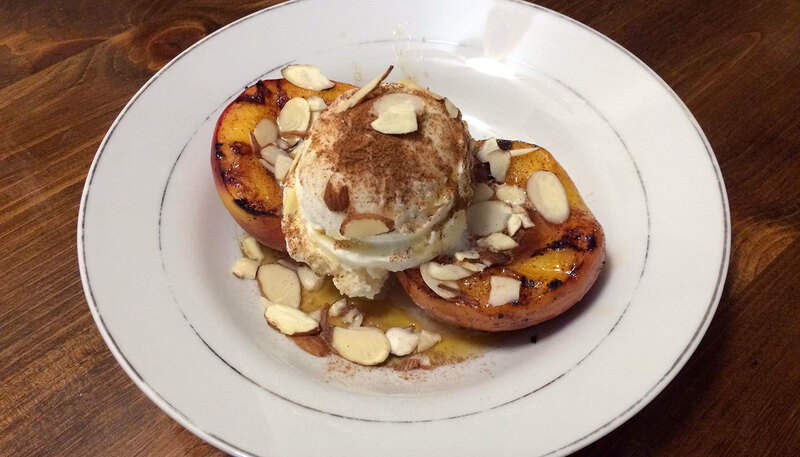 But one recipe always eluded me until a few years ago - grilled peaches. I tried a few recipes that I found online... some with honey, others with brown sugar; some with ginger, others with mint. But ultimately, I was looking for something to make an ice cream sundae with, and I just couldn’t bring myself to pair brown sugar and ginger with ice cream. I might be weird, but I’m not THAT weird. In the past I’ve had ice cream and waffles, which goes great with maple syrup. Well, maple syrup and peaches is a no brainer. And I’ve certainly had my fair share of bourbon peaches, whether bought from the farmers’ market, or homemade. So I did some experimenting, combined a few things together, and whammo! My own secret recipe for grilled peaches and ice cream. Which I will now share with you all, hence making it no longer a secret. But I won’t share my secret vanilla ice cream recipe. Yet. 1: Melt some butter. Mix in the maple syrup, bourbon, and cinnamon. 2: Halve the peaches, remove the stones, and brush the cut side with the maple bourbon mixture. 3: Place the peaches cut side down on the grill, and brush the skin side with the maple bourbon mixture. Side note: You’ll notice there are only 7 peach halves on the grill. I ate one. I can’t help it. 4: Grill until grill marks are achieved, between 3-5 minutes depending on how hot your grill is, and how ripe your peaches are. 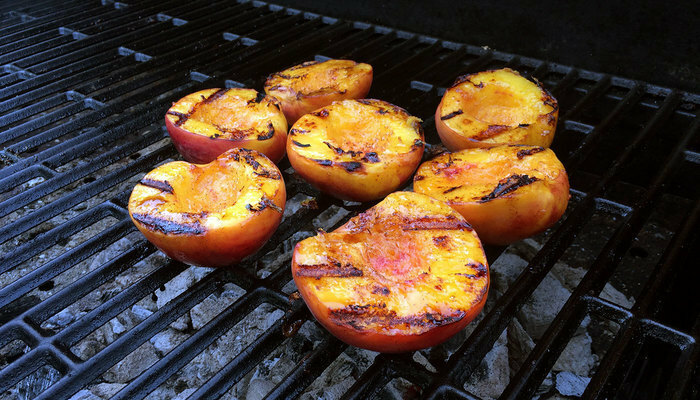 5: Flip peaches over onto their skin side, and grill for another 3-5 minutes. Remove from grill. 6: Place 2 peach halves in a bowl, top with 1 or 2 scoops of vanilla ice cream. 7: Top ice cream with a drizzle of maple syrup, a few dashes of cinnamon, and plenty of sliced almonds. 8: Consume. And Smile. And thank me. 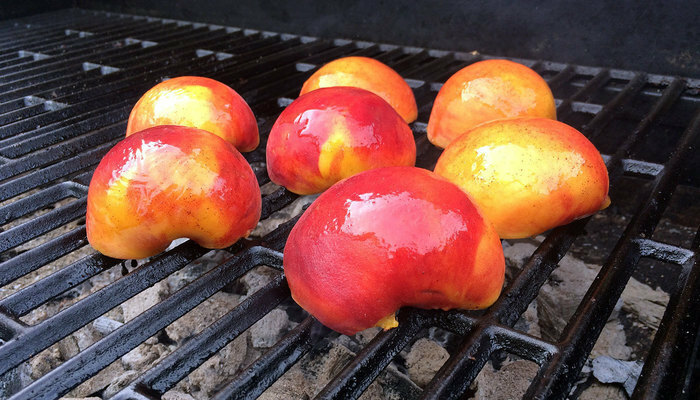 TIP: After taking the peaches off the grill, allow them to cool for a few minutes. If you scoop ice cream directly onto a hot peach, you’ll be drinking ice cream soup for dessert.